Penang has always been prominent about traditional hawker and street foods, and most collection of eateries in Penang are mostly about fun finger foods, lots of fried stuff and grilled things on sticks, and also small stalls for you to sit down, take a breather and have a more substantial soupy delicacy! Affectionately known as gerai or warung or just simply motorcycle peddlers manning their own kitchen, you can be sure that the air is filled with the aromatic mix of soy, rice wine, sesame, spices, frying oil, grilling meat and the high-pitched shouts of hawkers. Clouds of smoke waft above the dozens of small stalls that make up these eateries in Penang, with most of them brightly lit, sitting under coloured signs, while the delicacies are being conceived with their skilful hands. Fettes Park in Tanjung Tokong offers such a gastronomic sight, with a collection of street stalls offering the best cuisines the island has to offer. Beneath the scorching sun that imperiously shines on, several street peddlers have been plying their trade here – locals and foreigners have been lapping it up either as snacks or meals on its own. 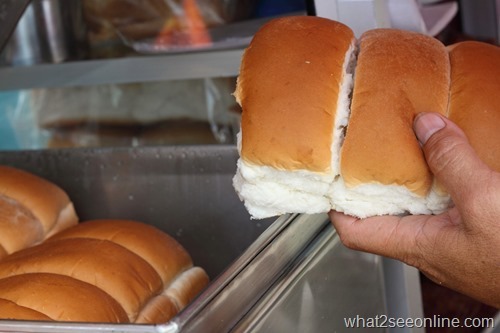 One particular dish that strikes a chord with the nostalgic senses of many will be the pork bun stall, better known as bak pau to the Chinese community. Freshly steamed buns cut open and slapped with thick black gravy from the pork meat is appealing enough. However, when the grilled pork slice, also known as bak kua to most Chinese, is placed smack right in the middle of the bun and pressed down, the result is a heavenly indulgent for the senses. Stepping deeper into the area, my nose leads my eyes towards a wafting aroma of laksa that fills the surrounding. An Indian chap on a motorcycle has been manning this little outfit for years now, and his offerings of laksa, deep fried popiah and cucur udang are just some of the many dishes available. Served piping hot, the laksa is a crowd favourite especially during the tea time as many customers will opt for something spicy yet sourish to tickle the taste buds. A must-do at this stall is to actually get those deep fried popiahs and dunk it into the laksa soup! Absorbing every plethora of cookery in the soup, every mouthful is simply splendid. For those opting for a simpler snack, he also offers curry puffs, assorted kuih-muih and also deep fried assortments. Last but not least, after all the waves of excellent snacks, there’s always a need to quench the thirst and look no further than the soya bean truck located just beside the collection of stalls. Offering ice cold soya bean milk with a traditional selection of black or white sugar, it also offers bean curd (taufufah) and grass jelly drink (leongfun) as well. All in all, I would say that it caps off the teatime perfectly! Located right in the centre of Prima Tanjung, the heat may be a turn-off for some as the rays of sun really does bite into the skin! However, there will be just days where the craving for these delicious snacks are insatiable and it’s definitely worth heading over to savour some of Penang’s best street food. Top 12 Penang Landmarks with Food Nearby!